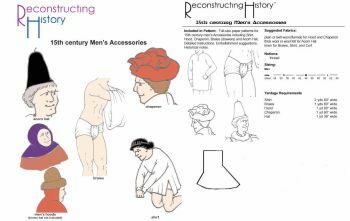 RC008 - 115th century Man's Accessories Pattern by Reconstructing History. Fits chests 34"-54" and waists 28"-50". All Sizes in one envelope. Everything you need to complete your 15th century male wardrobe! Looking for the perfect Medieval outfit? 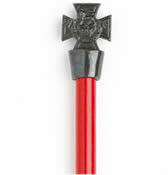 Need well-fitting braies for under your well-fitted joined hose? Then you need this 15th century accessories pattern! This is a pattern with complete instructions and historical notes for 15th century men's accessories including hood with and without liripipe, chaperon, shirt, braies (drawers) and the ubiquitous acron hat. Fits chests 34"-54" and waists 28"-50". All Sizes in one envelope. Historical notes and embellishment suggestions included.